At forty, May Attaway is more at home with plants than people. Over the years, she's turned inward, finding pleasure in language, her work as a gardener, and keeping her neighbors at arm's length while keenly observing them. But when she is unexpectedly granted some leave from her job, May is inspired to reconnect with four once close friends. She knows they will never have a proper reunion, so she goes, one-by-one, to each of them. A student of the classics, May considers her journey a female Odyssey. What might the world have had if, instead of waiting, Penelope had set out on an adventure of her own? 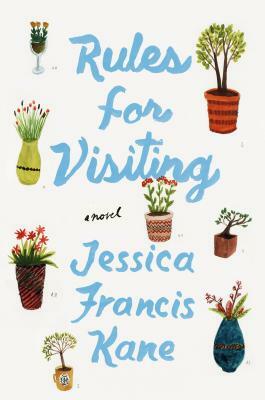 RULES FOR VISITING is a woman's exploration of friendship in the digital age. Deeply alert to the nobility and the ridiculousness of ordinary people, May savors the pleasures along the way--afternoon ice cream with a long-lost friend, surprise postcards from an unexpected crush, and a moving encounter with ancient beauty. Though she gets a taste of viral online fame, May chooses to bypass her friends' perfectly cultivated online lives to instead meet them in their messy analog ones. Ultimately, May learns that a best friend is someone who knows your story--and she inspires us all to master the art of visiting. Jessica Francis Kane is the author of This Close, The Report, and Bending Heaven. This Close was longlisted for The Story Prize and the Frank O'Connor International Short Story Prize, and The Report was a Barnes & Noble Discover Great New Writers Selection and a finalist for the Flaherty-Dunnan First Novel Prize from the Center for Fiction. Her stories and essays have appeared in a number of publications, including Virginia Quarterly Review, McSweeney's, The Missouri Review, The Yale Review, A Public Space, and Granta.